Have you checked out the new issue of Animals and You yet – it’s on sale today! 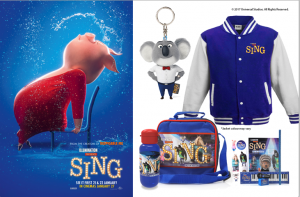 We have a fab comp to give away three bundles of Sing prizes, including a lunch bag, drink bottle, plush key chain, stationery set and a Kids Varsity Jacket – awesome! Sing is out now at cinemas – don’t miss out! For your chance to win, simple colour in the page that comes in issue #215 of Animals and You, on sale from today, before March 28, 2017. Include your full name and address, and a parent or guardian’s signature, and send it to: SING Comp, Animals and You No. 215, DC Thomson, 80 Kingsway East, Dundee DD4 8SL. The Prize must be delivered to one UK address. Delivery will be made within 30 days of the prize winner confirming their postal address to the Prize Supplier or Promoter. All prizes elements are subject to availability. The Prize Supplier reserves the right to substitute any prize with a prize of equivalent value. Anything not specified in these terms and conditions as being included in the prize package is excluded. If Winner elects to partake in any or all portions of his/her prize, the prize will be awarded to Winner and any remainder of the Prize will be forfeited and shall not be subject to further or alternative compensation. No cash alternative is offered for any Prizes and they are non-transferable and non-refundable. Winner(s) cannot change, vary, substitute or extend any element of the prize (in whole or in part). Next story WIN Tickets To See Shrek’s Adventure!